DMARC Monitor – Logix InfoSecurity Pvt. Ltd.
to enormous irrevocable financial loss jeopardizing the Brand’s repute. Domain-based Message Authentication, Reporting and Conformance (DMARC) is an email-validation system, designed to detect and prevent email spoofing. It is an email authentication standard for receiving mail servers to determine how to evaluate emails that claim to be from your/sender domain & works on “mail from” address. With more than 19 Years of experience in Enterprise Email & Email Security Logix is well positioned with its experts to discover, interpret, assess and analyze your DMARC compliance. Our team will handhold you through a well-defined action plan to achieve maximum compliance for your organization. 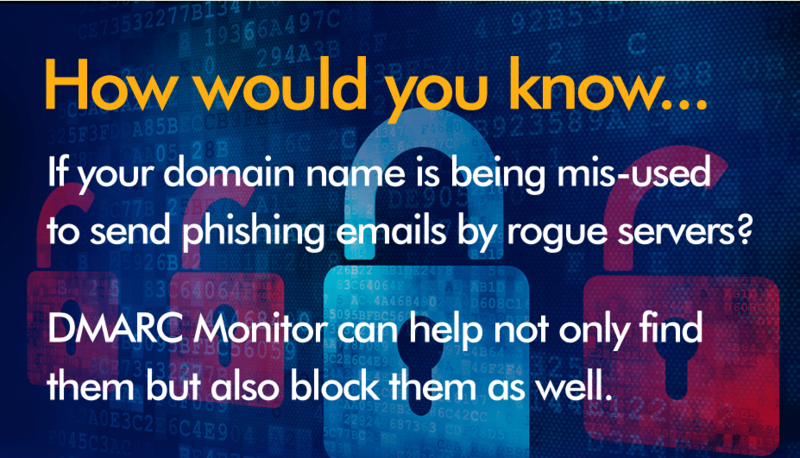 Make your Domain a “NO Phishing Zone” with DMARC Monitor, our comprehensive compliance based analytics that safeguards business enterprises against domain phishing & spoofing. After implementing DMARC Monitor, organizations will begin to receive raw data with many potential insights into their email traffic. Logix has core expertise in interpreting these reports & define action plans to achieve maximum compliance. Servers / IP’s which are sending email On-Behalf of your domains. These servers/IP’s can be identified, and SPF appropriately updated. All servers including the corporate email system will have to pass through Common email gateway which enforces DKIM. DMARC also enables senders to receive data back from receivers, providing insight into fraudulent email patterns. ISPs who support DMARC will also generate reports on sending activity for your domain. The reports are XML files that are emailed to the email address specified in your DMARC record.ISPs who support DMARC will also generate reports on sending activity for your domain. The reports are XML files that are emailed to the email address specified in your DMARC record. The reports contain the sending source (domain/IP) along with whether the message passed or failed SPF and DKIM. This is one of the best aspects of DMARC. Not only does it allow you to control email security for your domain, it also gives you deep visibility into who is sending on your behalf AND if they are signing with DKIM or passing SPF. The reporting and data received after implementing DMARC can be difficult to interpret. After implementing DMARC, organizations will begin to receive raw data with many potential insights into their email traffic. Having the capacity and expertise to transform this data into meaningful information can be an issue. Fortunately, if senders are willing to invest, this can be solved with managed services, who can take the data and turn it into actionable insights for senders. The reports that DMARC Monitor generates can help identify servers / IP’s which are sending email On-Behalf of your domains . These servers/IP’s can be identified and SPF appropriately updated. All servers including the corporate email system will have to pass through Common email gateway which enforces DKIM. DMARC brings these two mechanisms together in a powerful manner by allowing senders to specify a policy that tells receivers what to do with email messages that fail to pass SPF and/or DKIM validation. DMARC also enables senders to receive data back from receivers, providing insight into fraudulent email patterns. Before DMARC, there was not an effective feedback channel for failed email, so senders were largely in the dark on email once messages left their servers. Logix handholds a customer to the point that the customer can take a decision to change the DMARC Configuration to p=reject. DMARC Monitor is created with care, keeping your needs in mind. It is mix of user-friendly software and a personal advisor. It works like an expert guide and helps you to quickly put an efficient reject policy into place. DMARC helps you mitigate risks and block malicious emails without impacting your other email channels like marketing etc. Our DMARC deployment and project management specialists are always ready to assist you. Our specialist will guide you through every phase of the DMARC deployment and the maintenance process. You can choose from two types of DMARC Monitor services: viz: 1. Basic compliance checks and reports 2. Advisory services to ensure compliance and effective anti-phishing. We can send you reports with the current status of your DMARC implementation on a daily or weekly basis. It is always important to check your DMARC setup regularly and these reports help you with this. After moving your policy to reject, you should keep track of the DMARC statistics to prevent new invalid email flows from popping up. These reports show the DMARC compatibility rate for all your domains. You can see at a glance how the implementation is going and how your domain is protected. We offer various overviews of your DMARC data which you can filter based on a specific date range. In the overviews we give tips on which hosts may not yet be fully optimized. You can directly link to the third-party documentation about this subject in that specific tool. Based on our solid backend the overviews are near-real time and very fast! Our tool offers forensic reports from DMARC. This ensures that you can track invalid email flows faster. This overview is grouped based on the subject of the detailed message. Expanding the overview shows detailed results for the messages, including message headers.